Diana Barnett was born and bred in Hong Kong. She earned her law degree at the University of Hong Kong (LL.B., PCLL) and Harvard Law School (LL.M) and is qualified to practice law in Hong Kong, England & Wales and New York. She worked as a solicitor in Hong Kong until she felt called to be theologically equipped after the SARS epidemic in 2003. 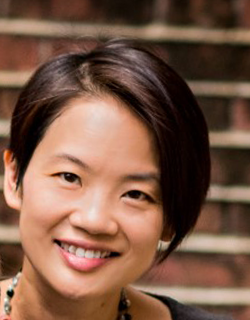 After studying at China Graduate School of Theology (MCS), Diana joined St. Andrew’s Church as a pastoral worker in 2006, overseeing our Growth Groups, teaching theological courses and helping parents integrating faith in parenting. Diana was appointed as the Executive Director in 2018. God has impressed on Diana’s heart how much Jesus loves His church (Ephesians 5:25-27) and she is passionate to help people grow their individual faith in the context of community. Partnering with God, her desire is to assist the Vicar in building a strong multicultural staff team at St. Andrew’s. She oversees the effective coordination across all our ministries and ensures the smooth operations of St. Andrew’s. She also continues to disciple and care for church members through leading Growth Groups, teaching courses, developing and training leaders. Diana was baptized at St. Andrew’s and met an Australian man called Matt in a bible study group in a “container come meeting room” at the St. Andrew’s carpark. Despite barely understanding a word Matt said for a number of years due to his Australian accent, they managed to fall in love, are now happily married and blessed with four delightfully spirited children – Maggie, Tom, Bob and Rebecca.